The glasses essentially automate the process of asking for an ID. When the wearer looks at someone, the attached camera apparently takes precise measurements of the person’s face. That measurement is then compared to a database of individuals, each with their own recorded measurements. The tech is reportedly able to determine a match within seconds. For riders, the police want to make sure the person on the train isn’t traveling with someone else’s ID or hopping a train to avoid police. 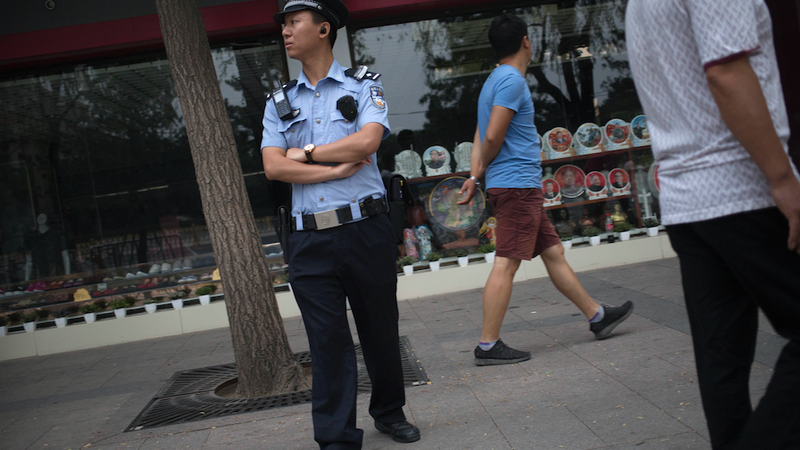 In the US, advocates are generally opposed to police putting people into databases that don’t differentiate between suspects and citizens, though China’s dragnet approach has drawn headlines for years. China mandates collecting biometric data on citizens and face recognition has become commonplace in cameras around the country. As counter-surveillance expert Adam Harvey told Gizmodo last year, wearables can majorly augment the processing powers of officers. It might take an officer hours to check, say, 200 people’s IDs, but this tech theoretically could do it in minutes, if it actually works as described. This rapid upscale in officers’ abilities to identify, surveil, and process people would bring with it new concerns about police ability. Conspicuously missing from both the original news coverage and the WSJ write-up are screens of what the officer sees. It’s possible the headset, which seems to look a lot like Google Glass, is capable of providing information about a match between a presented ID and a rider’s face, but details are scarce. The glasses were reportedly developed by LLVision Technology in Beijing. The ACLU has voiced concerns that wearable tech could be connected to all sorts of personal information on the matched person, their previous arrests, their address, employment status, etc. In the US, where citizens are assigned a “threat score” based on their likelihood of offending, the ACLU has expressed concerns that this information could pop up onscreen as well. As police collect more and more data on citizens, how long will it be until it’s all networked, indexed, and pops up every time an officer sees your face? While consumer smart glasses like Google Glass have failed to catch on, officer wearables are essentially an inevitability. From Alexa in police cars to all-seeing body cameras, officers will soon hold immense technological powers on their person. If officers are able to upscale their investigative powers this way, it’s more crucial than ever that we similarly upscale privacy protections or risk having them outmatched. Correction: An earlier version of this article stated that Axon “began to explore body cameras equipped with face recognition.” The company denies its AI-powered video analysis technology includes facial-identification capabilities.